Chart 3: Software Professional: Born February 13, 1968, at 17h. 28m. at 20 N 30, 85 E 50 with a balance of 10 years 2 months 2 days of Mercury Dasa at birth. If mahat phalam can also be interpreted in the sense of results of a major or important nature, not necessarily good, then its connotation could shift to challenges and stresses that could have a serious impact on one’s career. For instance in Chart 3, the software professional native began to find he was not getting recognition for his work and was further frustrated by the hostile treatment he was being meted out at his workplace. The harassment became so severe that he finally resigned his job in September 2010 unable to take it any more. The resignation came about in Sun Dasa, Venus Bhukti. Both planets occupy Dustanas, one as the 2nd lord and the other, as the Badhakadhipati or 11th lord for the moveable Ascendant Cancer. Neither the Sun nor Venus is connected with the 10th house to warrant the job-quitting. But the Dasamsa chart carries clear clues to such a development. The Dasa lord Sun in Aquarius and the Bhukti lord Venus in Virgo are in mutually adverse 6-8 positions (Shashtashtaka) pointing to dislodgement or change in status jobwise. 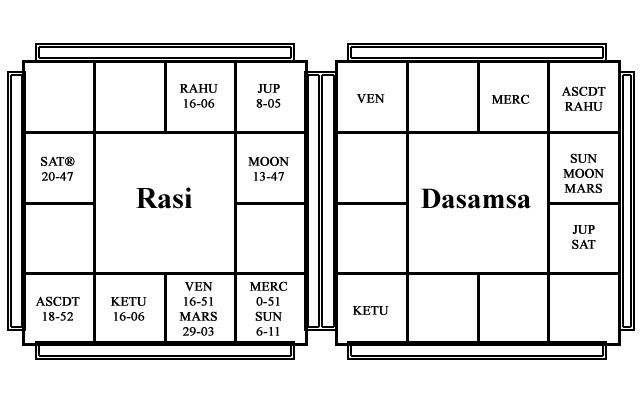 Though the Bhukti of Venus being the last in Sun Dasa brings the chart under Dasa-chidram, a difficult phase, the exact nature of the difficulty is shown by the two planets being in Shashtashtaka in the Dasamsa. Though the Dasa and Bhukti lords do not show specifically loss of job, it is also pretty clear from the fact of Venus being the Atmakaraka that his Bhukti can show (padachyuti) or loss of position. What the Dasamsa does, in this case, is to confirm what the Dasa-Bhukti do not hint at but which the Atmakaraka’s Bhukti indicates. The native of Chart 4 lost her job in Jupiter Bhukti of Venus Dasa in 2005. 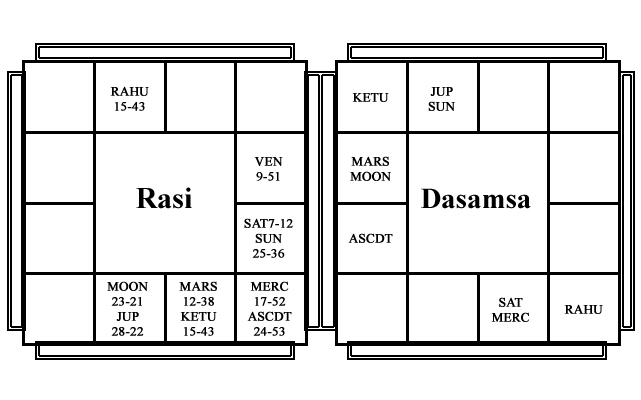 The two planets are in Shashtashtaka in Dasamsa showing dislodgement. The interesting feature of this chart is that she got a new job in 2008 in Saturn Bhukti of the same Dasa. Saturn and Venus too are in Shashtashtaka. … a Shashtashtaka or mutual 6-8 positions of the Dasa and Bhukti lords inDasamsa can bring a change in career status. If adverse influences are operating, the change in career status may take the form of losing one’s job. If the directional influences are favourable and the adverse transits are also thinning out, then the change of status could take the form of finding a new opening . . . Chart 4: Female: Born September 21, 1965 at 13h. 30m. at 11 N 28, 76 E 42 with a balance of 4 years 1 month 5 days of Saturn Dasa at birth. the change of status could take the form of finding a new opening thereby moving from a state of joblessness to that of employment or to a better opportunity. Chart 5: Male: Born September 10, 1948 at 8h. 03m. at 9 N 54, 78 E 48 with a balance of 8 years 5 months 13 days of Mercury Dasa at birth. even if somewhat unwillingly, the option of quitting the highly lucrative job. Rahu Dasa was on. Rahu is in the 8th house but being in Aries and aspected by his sign-dispositor Mars is quite strong. 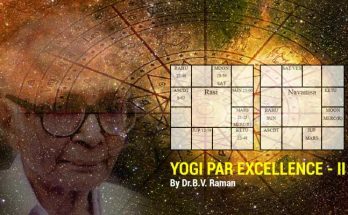 Further, he occupies Bharani ruled by Venus, a benefit for Virgo Ascendants, and is well-placed in the 11th house aspected by Jupiter. 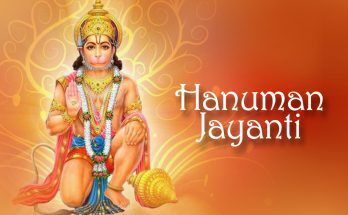 Jupiter Bhukti was on and Jupiter is well-placed but in the 8th from Dasa lord Rahu presaging a period of challenges. But from which direction can the blow descend? 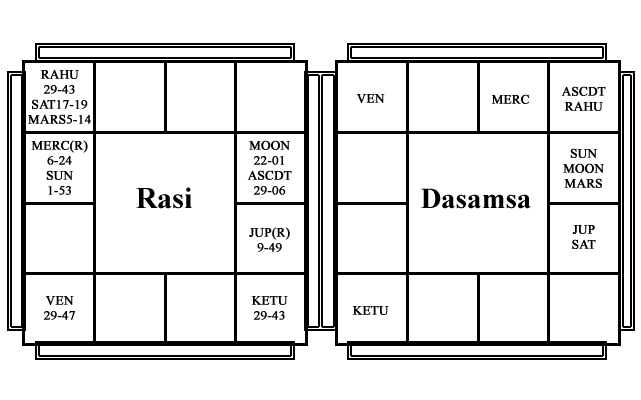 A reference to the Dasamsa shows Rahu and Jupiter, the Dasa and Bhukti lords, are in Shashtashtaka. Further, the Moon is in Aquarius in Dasamsa. Applying transits to this chart, we find it comes under ashtama Sani showing a period of great stress and strain in career matters. vague and difficult to specify. 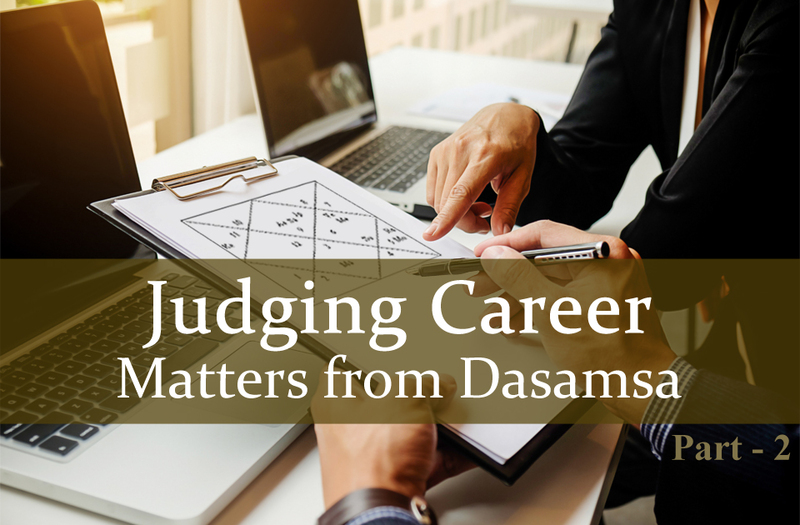 Where the Rasi chart itself is quite clear in its indications regarding career, the Dasamsa chart can be referred to for confirmation. 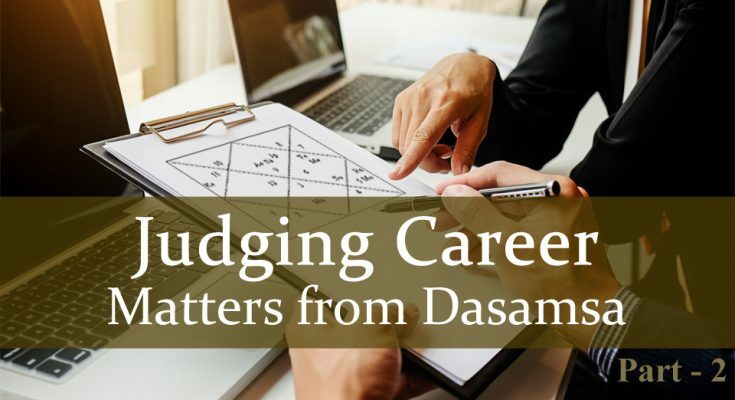 The Dasamsa positions, if strong, show a highly successful career. The more the number of planets in own, Moolatrikona or exaltation sign, the greater the degree of success. Planets in Kendras in the Dasamsa add to the career potential of the chart. 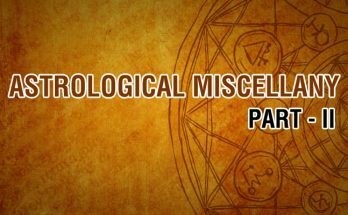 The Dasa of a planet in the Ascendant or a Kendra or a Trikona or Upachaya in the Dasamsa can indicate the period when one’s career begins to stabilize and pick up momentum. The Shashtashtaka positions of the Dasa and Bhukti lords in Dasamsa point to a change in career status. It can be either loss of job or acquisition of a job. Transit Saturn in the 8th form the Dasamsa Moon acts in much the same way as when he causes ashtama Sani in the Rasi chart showing severe stresses, strains and setbacks in the career which find a resolution as the adverse transit ends. These conclusions are not the final word on the Dasamsa and need to be tested and verified over a large number of charts. Nevertheless, they do help one understand this sub-divisional chart better.